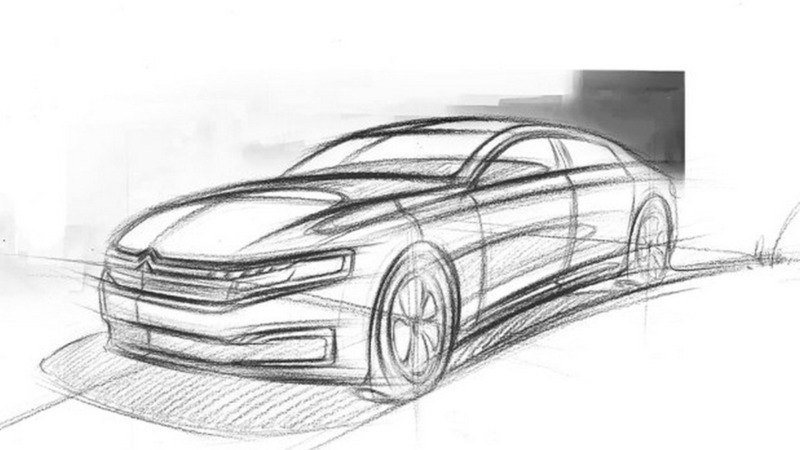 Dongfeng Peugeot-Citroën has released a teaser sketch for the all-new C6 slated for an official reveal in the coming months. Citroën has set its sights on bringing back the “C6” nameplate, but the fullsize sedan will be sold exclusively in China. The attached teaser indicates an official reveal is nearby and from what we’ve heard the model will be unveiled in April at the Beijing Auto Show. Pre-production of the model has already commenced in China and Dongfeng Peugeot-Citroën will start assembly of customer cars around September. The revived C6 will ride on PSA’s EMP2 platform and is expected to use turbocharged 1.8- and 2.0-liter gasoline engines. These two could be joined later on by a hybrid version, but we’ll have to wait for a confirmation from Citroën about that. It’s unlikely the Hydractive 3+ hydropneumatic suspension will be offered as PSA announced a while ago plans to drop this technology. That being said, something “revolutionary” to replace it is being prepared for a 2017 launch, but it’s not known which models will get the new suspension. It is believed Citroën will officially announce the C6 next week at the Geneva Motor Show. That is a little bit weird taking into account the model won’t be launched in Europe. A more luxurious version destined to be sold as a DS9 is expected to arrive in China early next year. While the C6 will be manufactured by Dongfeng Peugeot-Citroën, the DS9 is set to be assembled by the Changan PSA joint venture.